Harrison Smith sacks Matthew Stafford on second down. This late second-quarter drive is not going according to plan.
.@HarriSmith22 with his 1st sack of the season and his 5th of his career.
.@HarriSmith22 with his 1st sack of the season the 5th of his career. A few boos at Ford Field after Matthew Stafford throws a 5-yard pass on third-and-18. A good case could have been made for a 2PT conversion on that last one to get within 3. Given Walsh's pattern now, it might be good to do more 2PT attempts when reasonable. Surely, Ebron wasn't supposed to go out of bounds to save time for the Vikings, but the ball led him that way. The Lions somehow held when they were punting. Since 2012, @HarriSmith22 is the only player with 10+ INTs and 5 sacks in the NFL. 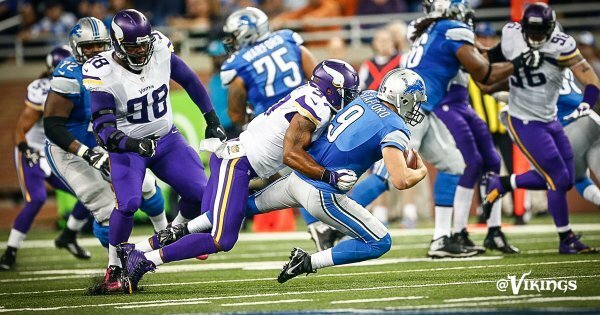 Ansah and Taylor sack Bridgewater on third down, making a longer FG for the Vikings. #Vikings have now allowed 15 sacks in 2.5 games on the road this season. Back-to-back week's with 170+ passing yards in the 1st half for @teddyb_h2o . 189 yards today ties 2nd-highest in any half of his career. 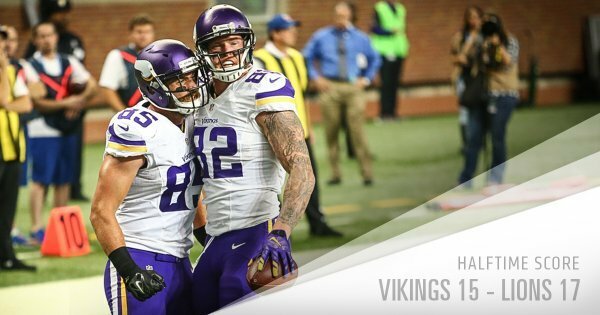 The #Vikings trail 17-15 at halftime. K @BlairWalsh3 has multiple 50+ yd FGs (51,53) for the 2nd time in his career. Last was 12/16/12 against STL.
.@BlairWalsh3 with his 2nd career game with multiple 50+ yard FGs. Connected on 3 50+ yarders @ St. Louis on 12/16/12. That’s @BlairWalsh3 ’s 19th career FG of 50+ yards, extending his own team record.
.@BlairWalsh3 's 19 FGs from 50+ yards since 2012 are the most in the NFL in that span. He is 19-of-26 from 50+ yards in his career. Our thoughts and prayers are with the Saunders' family and the entire @Timberwolves organization.
.@stefon_diggs ' halftime stats: 3 catches for 43 yards, 1 rush for 9 yards. Bridgewater still moving the ball without an effective Peterson, or sound protection. Four scores (three FGs) on five drives. No punts.
.@HarriSmith22 's halftime stats: 9 tackles (5 solo, 4 assisted) and 1 sack.
.@EversonGriffen had one of #Vikings 3 sacks in the 1st half. 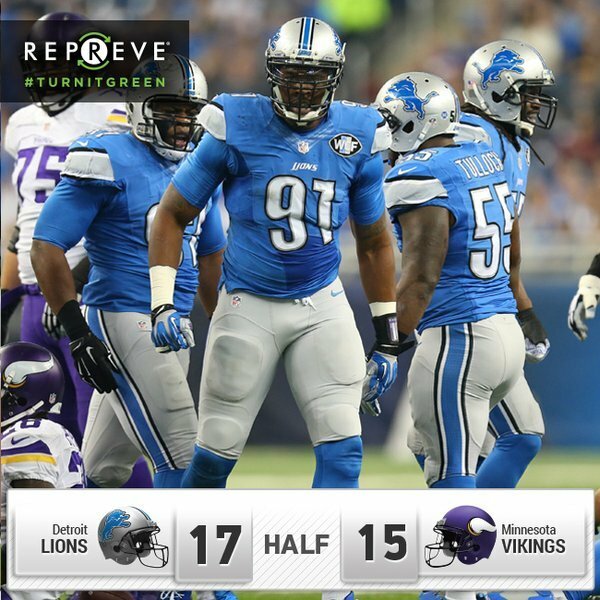 Ansah, Ngata, Jones and Reid are on the sideline to start the third quarter. Lions going with backup DL out of the break for some reason.
.@teddyb_h2o 's 189 1st half passing yards ties his 2nd-highest total in any half in his career (197 vs. ATL, 9/28/14 & 189 @ DET, 12/14/14). Ansah and Ngata finally on the field for third down after sitting first six plays of the drive. teddy takin a hellova beatin! Holding on Quandre Diggs nullifies a third-down sack by Jason Jones. A DET penalty gives the #Vikings a first down.